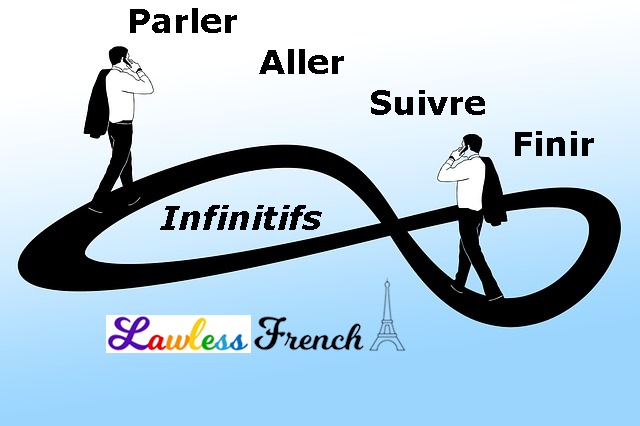 The French infinitive, which always ends in –er, –ir, or –re, serves as the name of any given verb. It’s what you look up in dictionaries and verb conjugation tables, so it’s important to learn the infinitive of every new verb you see or hear. Because the infinitive has no number or person marker, it’s known as an impersonal verb mood. French infinitives are generally equivalent to "to" + verb in English. When speaking or writing French, verbs usually need to be conjugated, but there are several constructions that require the infinitive itself. semi-auxiliary J’espère partir à midi. I’m hoping to leave at noon. causative Nous faisons réparer le toit. We’re getting/having the roof repaired. request Il m’a demandé de chuchoter. He asked me to whisper. impersonal expression + à / de Il est difficile à comprendre. That’s hard to understand. copular verb + adj + de Je suis désolé de l’apprendre. I’m sorry to hear that. avoir + noun + de Elle n’a pas envie de manger. She doesn’t feel like eating. The infinitive is only used when the above constructions end in a preposition. When they are followed by que, a conjugated verb is required – possibly the subjunctive – learn more. Chauffer l’huile sur feu modéré. Heat the oil over medium heat. En cas d’incendie, composer le 18. In case of a fire, dial 18. It might help to imagine a phrase like Il faut or Prière de in front of the infinitive. Word order with the infinitive is different—and much simpler—than with conjugated verbs: everything goes in front of the infinitive. Ne pas ouvrir la porte. Don’t open the door. La chauffer pendant 30 seconds. Heat it for 30 seconds. Je t’ai dit de ne jamais l’ouvrir. I told you never to open it. 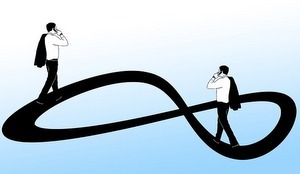 The infinitive can also be used as a noun; the English equivalent is either a noun or a gerund. Voyager seul peut être dangereux. Traveling alone can be dangerous. Voir, c’est croire. Seeing is believing. Savoir, c’est pouvoir. Knowledge is power. How do we know if we’re supposed to use “à” or “de” before the infinitive (à+infinitive / de+infinitive)?